I think we all know by now that Rick Klotz is no stranger to controversy. 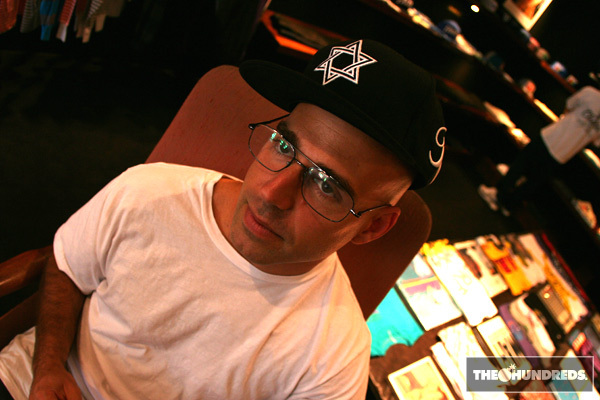 After beefing with streetwear brands and rockstars, he’s under fire from a new, more complicated, entity: The Jewish Defense League. 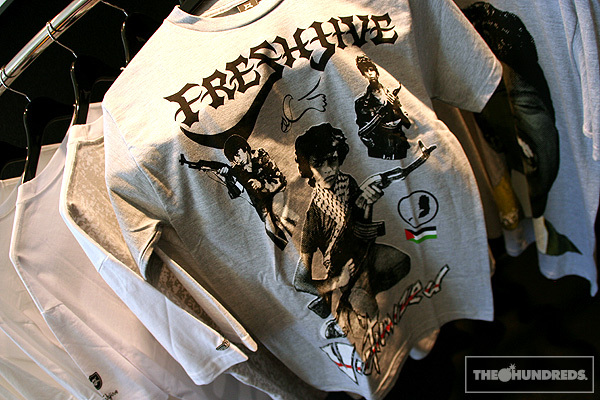 Rick, and his veteran L.A.-based apparel brand Freshjive, produced a couple t-shirts this season that have been intensely scrutinized by certain members of the Jewish community. 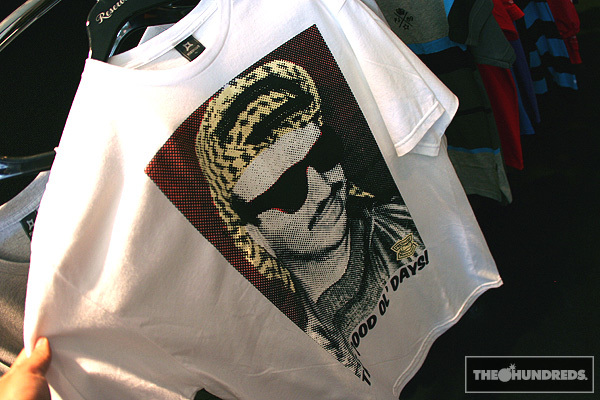 The first shirt depicts Palestinian children with the word “Victimized” emblazoned across the bottom. 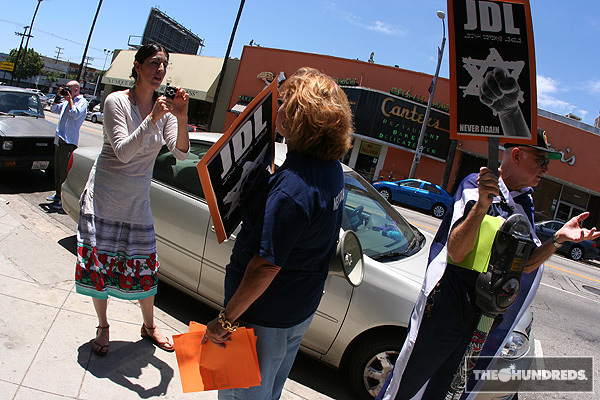 I’m not gonna weigh in any of my own opinions here (You can read Rick’s personal defense and reasoning behind his artistic choices on the Freshjive blog), but the ultra-controversial terrorist group The JDL certainly voiced theirs this afternoon on Fairfax in front of Rick’s store Reserve, storming up and down the sidewalk with picket signs, bullhorns, and an artillery of verbal warfare. 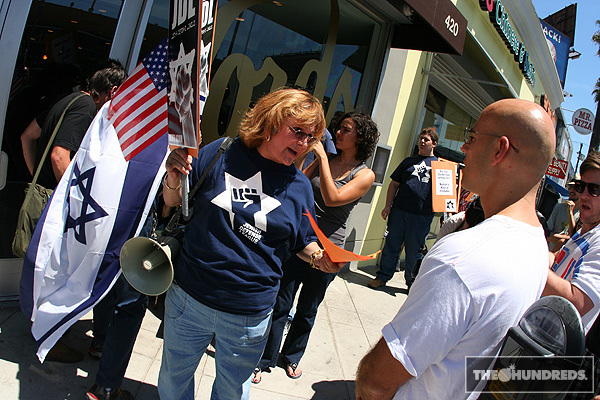 Shelley Rubin is the current chairman of the JDL. 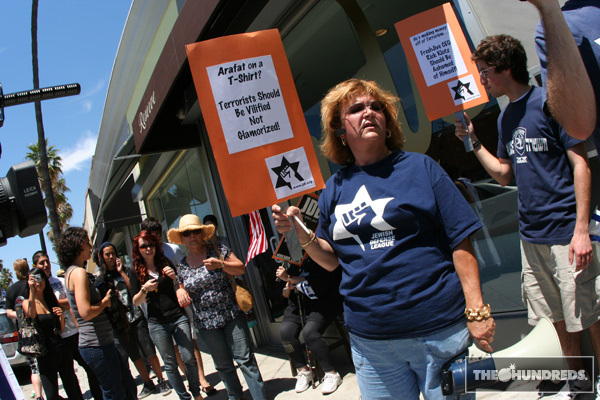 Her husband, Irv Rubin, ran the JDL for 15 years before being imprisoned for planning a terror attack against an Arab-American Congressman and 2 attacks on a Muslim mosque here in L.A. He ended up “killing himself” in jail (read: being tossed 18 feet over a railing by other inmates), leaving his lil’ firecracker Shelley in charge. 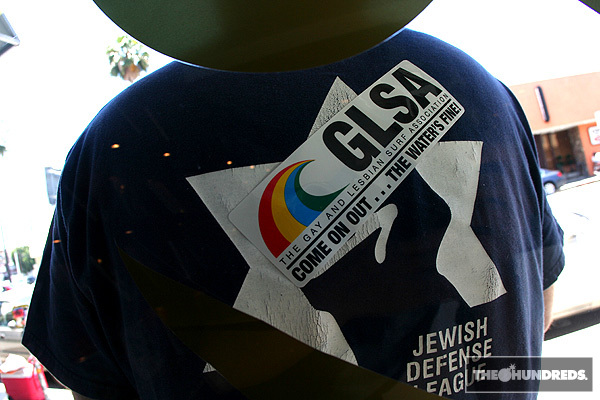 You gotta read up on the JDL. 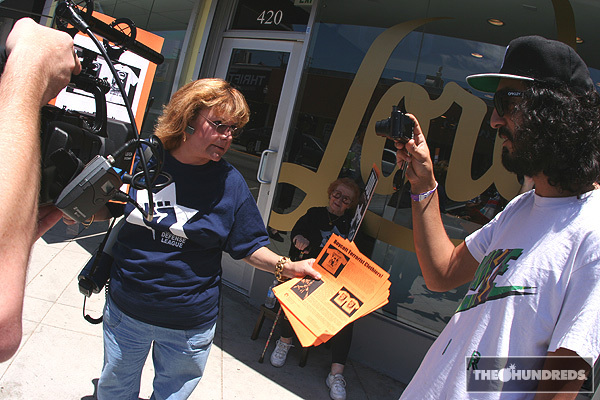 Shelley’s late husband and the JDL allegedly provided Eazy-E protection from Suge Knight back in the early ’90s, as well as indirectly being involved with Death Row’s inception. I know, weird but true. At one point, Shelley just started wrecking shop on everybody. Somehow, she got into it with Reza (The Arab Parrot). C’mon Shelley, you’ve taken on the Soviets and the FBI, but we all know this is a losing battle. Sitting deep in the bunker. I don’t know how that got there. The eventual Shelley vs. Klotz showdown was anti-climactic. So much misinformation and inaccuracy,.. Shelley could’ve used a gigantic Jump-to-Conclusions Mat for Chanukah. The cops finally showed up and the crowd dissipated. Yawn. Okay, click on the video to watch some of my footage from the afternoon, along with the Arab Parrot’s colorful commentary. Classic.